Playful California sea otters inhabit a place of overlapping worlds. Their home is the coastal ocean, a zone where the land meets the sea. An otter’s daily business of eating, resting, and more eating can bring it close to shore, much to the delight of coastal sightseers. 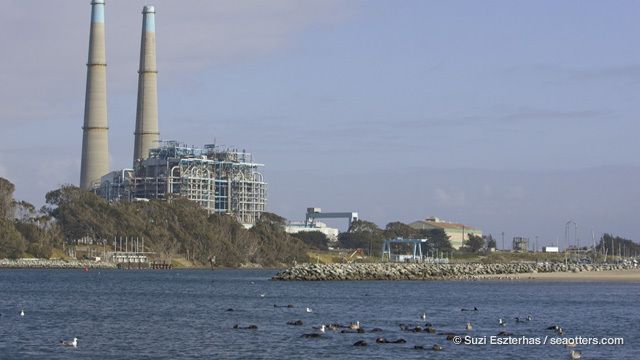 However, prime sea otter habitat near land often bears the brunt of pollutants that drain from areas of human habitation. This resulting contaminant stew immerses otters in a sea of troubles. For the past two decades, scientists have tried to unravel the tangle of threats that besiege California sea otters, and better understand how human activities impact the health of ocean wildlife. Fur hunters in the 18th and 19th century nearly drove sea otters to extinction for their thick, luxurious pelts. Sea otters have the densest fur of any animal, with as many as a million hairs per square inch. After multiple countries passed a moratorium on sea otter hunting in 1911, only remnant populations survived around the Pacific basin. The California or southern sea otter (one of three subspecies that also include Russian and Alaskan sea otters) recovered from a single relict population living near Big Sur. Southern sea otters have been listed as a threatened species under the federal Endangered Species Act since 1977. While California sea otters have made a substantial recovery, decades of protection haven’t helped their population bounce back as dramatically as hoped. Annual surveys currently peg the California sea otter population at about 2,700 individuals, short of the minimum of 3,090 for 3 years running needed for delisting from the Endangered Species Act. Their numbers have hovered at 2,800 otters in recent years, and the current estimate represents a population dip instead of growth. What is behind this population plateau? Scientists have pinned the cause on too many deaths of mature adults, especially females who should be producing pups. However, understanding why otters are dying is far from straightforward. No single factor jumps out as the most important cause of California sea otter deaths. Rather, scientists have discovered that otters encounter a complex and deadly cocktail in contaminated waters, and many are dying from the combined onslaught of diseases, parasites, and toxic compounds. Part of sea otters’ high susceptibility is due to their diet. Because of their high metabolic rate, to maintain their energy levels sea otters consume up to 30% of their body weight in invertebrate prey each day. A large proportion of this prey consists of filter-feeders, such as mussels and clams. These organisms indiscriminately sieve particles out of the water, and can accumulate high concentrations of pollutants and disease pathogens. When otters feast on shellfish chockfull of bacteria, parasites and contaminants, they expose themselves to harmful or lethal doses. Because of their vulnerability, sea otters are considered a sentinel species, meaning they can serve as indicators of the ocean’s overall health. Otter die-offs in recent years have alerted scientists to several harmful events in the marine environment. In the early 1990s, a wave of otter deaths brought a foreign, microscopic killer to light. Otters were dying of brain infections caused by a parasitic protozoan, Toxoplasma gondii, which is found in cat feces. Cat waste that enters waterways, facilitated by roaming feral cats and flushable kitty litter, drains to the ocean and delivers a powerful punch to otters. Hardy Toxoplasma eggs can contaminate sea otter food and remain infectious for weeks. While native felines such as bobcats and mountain lions can also host the parasite, millions of introduced domestic cats in California have magnified the impact on otters. Sea otters also suffer from another fatal brain parasite, the protozoan Sarcocystis neurona, which comes from Virginia opossums. Opossums were introduced to California in the early 1900s. Without a long history of exposure to such introduced pathogens, sea otters have few natural defenses to counter them. These parasites can kill otters outright, or cause brain damage that makes them more vulnerable to boat strikes and shark bites. However, many otters can survive the initial parasite infection, so scientists suspect other factors also contribute to impede sea otter population recovery. In 2003, a huge spike in California sea otter deaths caught national attention, and federal agencies declared the die-off an unusual mortality event. Scientists identified one contributing culprit as a species of phytoplankton. Phytoplankton are tiny plant-like organisms that support many ocean food webs, but some of these microscopic algae can also produce potent and deadly toxins. The diatom Pseudonitzschia australis, which bloomed in large numbers during 2003, produces domoic acid. This toxin causes amnesic shellfish poisoning in humans and can lead to seizures in marine mammals. While blooms of phytoplankton naturally occur with changing ocean conditions, nitrogen waste from human activities, such as agricultural run-off and sewage, adds a huge dose of fertilizer to the system. The cause of algal blooms is complex, but excessive nutrients from human inputs appear to be one important contributor. Recently, scientists have linked a California sea otter die-off to another unlikely culprit that grow in fresh water: cyanobacteria. The cyanobacteria Mycrocystin produces a highly-potent microtoxin, and can coat lakes and creeks with a neon green scum. To wreak havoc on ocean-dwelling otters, Mycrocystin or its toxins must travel from freshwater to the sea. Scientists have measured massive amounts of microtoxin in areas like Santa Cruz County’s Pinto Lake. Like other pathogens and chemicals, it flows to the ocean and accumulate in sea otter food. Microcystin causes liver failure in otters, as well as heart and brain damage. This is the first documented case of marine mammal deaths caused by freshwater cyanobacteria. Otters that live near areas of dense human inhabitation often exhibit much higher concentrations of persistent organic pollutants in their tissues than otters from more pristine locations. Pollutants such as polychlorinated biphenyls (PCBs) and dichloro-diphenyl-trichloroethane (DDT) and it’s break down products can damage otters’ nervous systems, affect pregnancy, overall health, and compromise their immune systems. Sea otters are also particularly vulnerable to oil spills because of their thick fur. Unlike other marine mammals, sea otters have no blubber, and depend on air trapped in their dense fur to insulate them. Sea otters with oil-matted fur cannot maintain their body heat, and can die of hypothermia. A single large oil spill could devastate the relatively small regional population, and deal a heavy blow to sea otter recovery in California. Sea otters seldom die of just one cause, but one striking aspect unites the diversity of sea otter threats: most can be traced to human sources or influence. Since humans and otters inhabit two different worlds, these impacts demonstrate the intimate linkage between the land and sea. Pathogens and pollutants flow from the shore into the ocean, and cause the most problems where these two worlds meet at harbors, river mouths, and bays. With more than half of the U.S. population living in coastal areas, the nearshore environment is one of the most heavily impacted parts of the ocean. Clusters of sea otter deaths tend to occur around areas of high human population. However, the influence of people may also offer otters some reasons for hope. Since humans are the source of many sea otter problems, we can also take actions to stop or lessen their impacts.